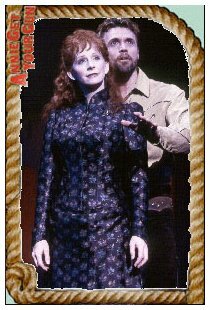 Reba McEntire in Irving Berlin's "Annie Get Your Gun"
Photos by Carol Rosegg, from the Annie Get Your Gun Website, used with permission of The Pete Sanders Group. 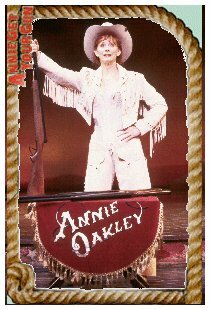 Out of all of the people in the world, one person is more suited to portray legendary marksman Annie Oakley than anyone else. That person is Reba McEntire. Discovered while singing the National Anthem at a rodeo, Reba is the daughter and granddaughter of rodeo champions as well as being a barrel racer herself. Her personal history , combined with her status as an actress and country music superstar make her not only a good choice, but the best choice to play the part. 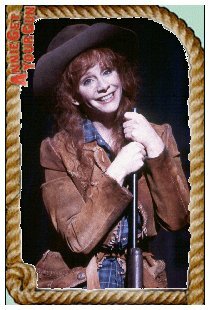 In addition to her glittering resume, Reba had already portrayed Annie Oakley in the CBS miniseries "Buffalo Girls". 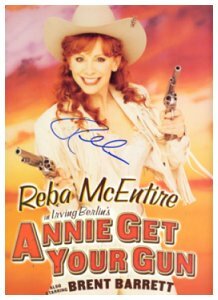 Reba had no intention of pursuing this role, however, the world got lucky when she had some extra time while in New York and decided to go see "Annie Get Your Gun". After seeing it she was so taken by it that she set in motion the chain of events that would end up with her in this role and taking Broadway by storm. 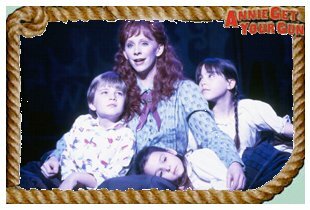 As Annie, Reba's unique combination of "down home" meets "larger than life" adds up to a character that is riveting, loveable and more importantly incredibly realistic. Her acting was of course flawless and her vocals were even better. Particularly impressive were her renditions of the touching "Lost In His Arms" and the comical "You Can't Get A Man With A Gun". Her Dueling duet with costar Brent Barrett marvelously showcased the vocal talents of both singers. This is after all a country music magazine so, even if Reba were not the brightest star I would of course focus on her. It would however be both unjust and ludicrous not to mention at least a few of the many other talented people who made this event magical. The performance of Brent Barrett (as Frank Butler) was itself worth the price of admission. The Comedy of Larry Storch , who you may remember as Sgt. Agarn from F Troop, (as Sitting Bull) and the commanding presence of Conrad John Stock, who was Daddy Warbucks in Annie (as Buffalo Bill) were remarkable and memorable as well. Even more unbelievable than all of this is that this gigantic accomplishment is only one part of what Reba is doing this year. She made an appearance in the recently released movie "One Night at McCool's, is planning her "Girls' Night Out Tour" ( The first ever all female country music festial that promises to be the country event of the summer) and is slated to begin work on a WB Network television series titled "Reba" that will air this fall. As the mythical King Midas had, Reba McEntire has turned everything she has touched to gold. One can only wonder what could possibly be next?